Checking water-fill hoses and fittings. After a couple years of use, the hoses in a washer may deteriorate. It is always good to check every once in a while if the hoses are cracked, blistered, or leaking. Similarly, check the fittings surrounding to see if they are corroded in any manner. Should you find any of these warning signs, you need to replace the hoses and fittings immediately, preferably with higher-quality steel hoses. 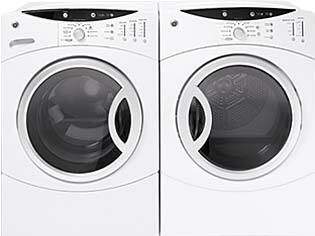 We specialize in any kind of washer repair and can help you with any maintenance or installation issues. However, the main issue, above all, is always your safety: should a blistered hose burst, hundreds of gallons of water can be spilled in just an hour. If the water is hot, it is particularly dangerous to the surrounding appliances and you. It is recommended to replace washer hoses every 3-5 years. Diluting detergent and fabric softeners. These liquids are generally very thick and as a result, can clog the water dispenser drawer and jets, potentially leading bacteria to build up. It’s recommended to dilute the detergent and fabric softener with water, usually about a 50/50 division. Cleaning the dispensers. If the dispensers become clogged or leak detergent, it’s a good idea to take them out and clean them thoroughly. If it’s possible to remove the dispenser drawer, soak it in hot water and scrub with an old toothbrush. Furthermore, it’s beneficial to scrub the dirty spots, or “gunk,” on the roof of the machine where the jets are located with hot water. If the dispenser drawer is unable to be removed, then run hot water through it until it appears to be clean and ready to use again. Leveling the washer. When washing machines are in use, they may vibrate from the heavy spinning cycles. It’s a must to keep the washing machine level on the ground, otherwise it will violently rock back and forth and as a consequence, may become damaged or damage other appliances. You can level the washer with a simple leveler and by adjusting its front or back legs. Cleaning the interior. It’s recommended to run a maintenance wash once every 1-3 months by setting the washing machine to its hottest temperature and letting it run (without any clothes inside!). Some sources recommend adding 2-3 cups of white, distilled vinegar to the empty wash, which will help in the cleaning process. If the tub contains some signs of bacterial residue, put in some lime scale remover or soda crystals. Cleaning the exterior. Keep your washing machine pretty! It’s fine to use general dish detergent and a wet sponge or rag to help keep it nice and polished. Be careful with stain removers or other stronger chemicals, however, like ammonia or bleach, because they might damage the surface. It’s not necessary to be hypersensitive towards the state of your washing machine, but it certainly is beneficial to be aware of potential problems and issues. If you ever have any questions, or if your washing machine decides to up and stop listening to you one day, please don’t hesitate to call us at SoBellas Appliance Repair. We serve in 3 locations in 2 states, serve more than 35,000 customers, and offer same day service calls. We’ll help keep your washing machine happy (and in turn, you)! Contact us for any questions on your local appliance repair issues today. Washer repair pros help fold your laundry. Most people in Texas remember to periodically clean their residential washing machines inside and out. There are also those that never miss a chance to disinfect their machines’ interiors too. But there is one area that gets neglected more times than not, which troubles our washer repair techs. Do you know which washing machine part we’re talking about? It’s the seemingly lowly hose. They may appear insignificant at first but they’re categorically not. Without them, washing machines cannot move water and other liquids throughout their respective cycles. With that said, our washer repair team likes to think of them as silent workhorses. They literally stay behind the scenes and do a large part of the hefty lifting every time the machine is in use. However, when one breaks open or leaks, everyone notices and scrambles to call for washer repair. To help our customers steer clear of those wet moment, we like to periodically inspect all of the machine’s hoses. Our techs also recommend replacing the hoses every few years whether they look in good shape or not. After all, signs of dry rot may not be readily visible. For instance, the hose could be weakening from the inside out. As such, it will likely appear fine on the surface but burst open the next time the washing machine is used. As expected, hose material breaks are not the only problems that arise over time. There may be occasions when the hose’s fitting, gasket or screen fails too. If the gasket or fitting fails, they’ll undoubtedly be leaks to worry about. As for screen failures, they could exacerbate sedimentation problems. And those types of problems can ultimately damage clothes too. So to learn more about keeping washing machines’ silent workhorses in excellent shape before it’s too late, please contact us today.